This is a sponsored post but all opinions are my own. Feeding solids has been a fun adventure for us so far. Making my own homemade purees has also been fun and relatively easy, but when Little Spoon contacted me to try their organic purees I took them up on the offer because the flavors sounded amazing and I love that it's a customizable meal plan that gets delivered every other week. Hello convenience! So in the midst of all the chaos that has happened over the last few weeks since my father in law passed away, I had zero time to make any homemade purees, luckily my Little Spoon box came at the perfect time so we had fresh, organic food on hand that we could just pop the lid off and start feeding to Georgia. I was extremely impressed with what I got in our first box. It came packed with a bib plus a small cooler bag filled with 8 different Babyblends. Blends are chosen based on baby's age which is another thing I like about what they offer. Babyblends start with Step 1 - Single Ingredient servings for 4+ months, Step 2 - Fruit & Vegetable Blends - 6+ months, Step 3 - Textures & Superfoods - 9+ months, & Step 4 - Whole Chunks & Textures - 12+ months. A few of the blends we got were Kale, Carrot, & Pear, Beat, Banana, & Mango, and Carrot, Apple, & Ginger. Each little container comes with 4oz of food and a little spoon attached to the lid so you don't need any kind of utensils of your own. I ended up freezing about half of what I got because the foods have to be eaten within 14 days after you've received them because there are no preservatives in them and they are not processed. Our first experience with Little Spoon has been nothing but positive. Georgia has enjoyed all of the flavors that she's been able to try so far and, once again, that word convenience just keeps coming to mind when I think about ways to describe their service. 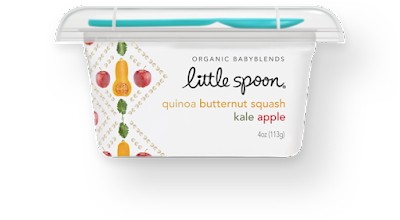 I think we all want food that is safe for our babies, but that may not always be an option, with Little Spoon you know the food you're feeding your baby is made from quality organic ingredients, super-foods, and healthy fats. This helps create healthy habits from an early age and encourages our little ones to hopefully make health choices when they are old enough to pick foods for themselves. As of right now the website in in pre-launch but you can request an invite (and they open it up to you very quickly) to get started with their delivery program. I also thought I'd share a quick list with you guys of my favorite feeding accessories so far. Fisher Price Space Saver Highchair - we love this because it just attaches to one of our bar stools, its easy to assemble and to clean. Silicone bib - easy to rinse off and clean each night rather than putting a cloth bib in the washer each time! Feeding spoons - love these because they're colorful and are easily rinsed and reused. 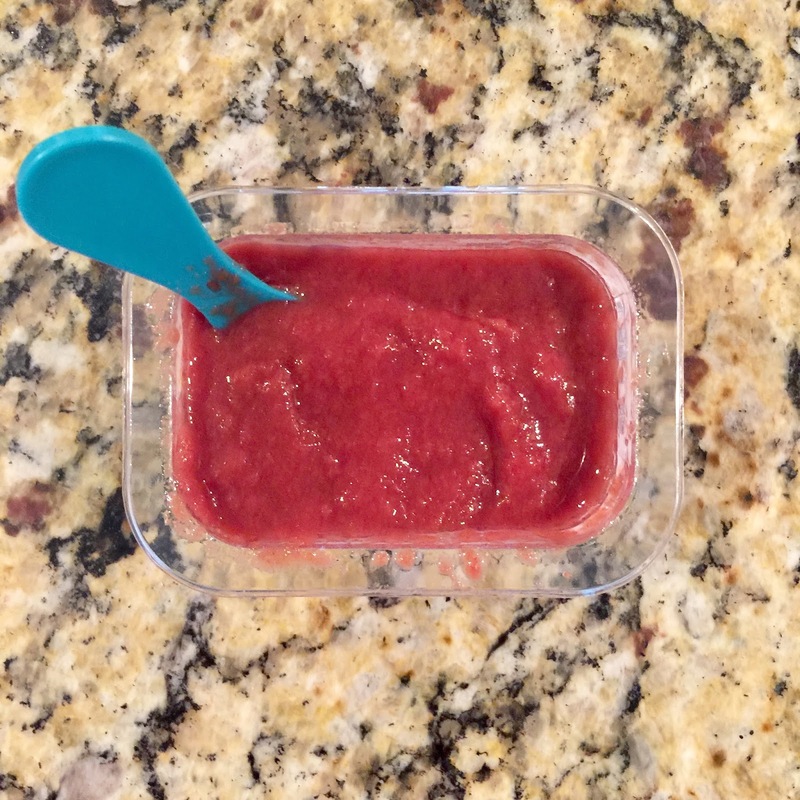 Bowl with Lid - these are a must for us, easy to put a couple frozen sticks of food into the night before daycare, then by the next day they're thawed and ready to go in a reusable container. Milkies Milk Tray - this is actually used to freeze breastmilk into one ounce sticks but I've used it to freeze my purees so I know exactly how much she is getting with each feeding. OXO Tot Glass Baby Food Blocks - these are also nice containers for freezing baby food for those of you trying to avoid plastics. Georgia is a cutie and how cute that it comes with a spoon. Oh gosh. I actually hate hearing about Little Spoon. I was on their waitlist forever and finally stopped following them on instagram. So sad. But I'm glad to hear that you actually got some and your baby girl likes it!